Cost: There are no set fees for this seminar. All we ask is a gift to help offset expenses and housing when applicable. Fill out this form to schedule a seminar. For far too long, Christianity has been dominated by an unbalanced view of the God/man, Jesus. The false doctrines of a mild-mannered Messiah offering grace without responsibility has captivated our entitlement culture and has gutted the church of her resolve. 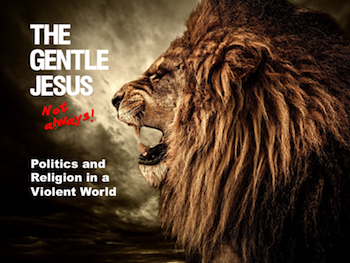 As the dark clouds of religious persecution gather, it is imperative that Christians know the complete nature of the Lion of Judah. Not only did Jesus express himself openly on the topics of politics and religion, He occasionally went so far as to bait His listeners into life-changing debate. The gentle Jesus? Not always! For a complete list of seminars presented by Sonny Childs, go to the Seminars page. Back to Top of "The Gentle Jesus? Not Always! Seminar"